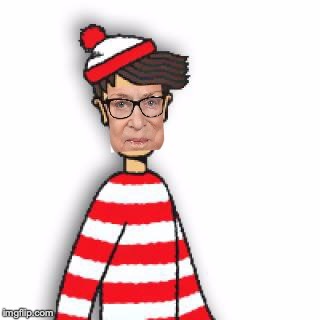 Where’s Waldo (er, I mean RBG)? Lots of talk about Ruth Bader Ginsburg the past few weeks. First her illness, surgery, and recovery. Lots of questions about where is she, is she well, is she dying, is she dead? Earlier this week, the Washington Post reported that she was seen at a concert in her honor, the music written by her daughter-in-law, but there were no pictures. Supposedly she was sitting in the very back and no photographs were allowed. This seems odd to me (and lots of other people). Not so much that she didn’t want photographs (although since the entire performance was in her honor, it seems really strange that she wasn’t even acknowledged as being in the audience), but that someone didn’t sneak a picture with their phone. You know that nothing of interest goes un-photographed these days! I don’t know that this is proof^^^. Or this, which is a video of the entire concert. 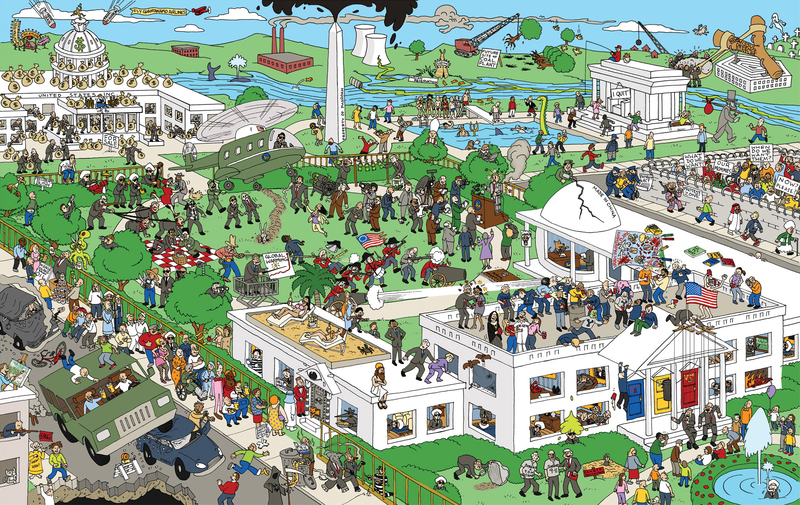 19 Responses to Where’s Waldo (er, I mean RBG)? Or appear at the SOTU address. Or resume her duties. I never believed she could jog at all. It seemed to me she had trouble walking……or even moving. Dad had the exact cancer as RGB. The cancer quickly spread to the brain. Short-term memory went first, then long-term memory, concurrent with bodily functions such as walking or even standing. It all progressed quickly, less than a year. RGB went to a concert? Show me. Until then, my memories remain intact and proven true, 17 years later. Still, wishing all the best for RGB. Sorry about your dad Jean 😦 . My father had lung cancer. He was strong, , no osteoporosis, and still active, until the cancer pulled him down. He was 90. They did some radiation, but the mass came back or something. Interesting. When I have been to something like this that was done in someone’s honor, either at the beginning or the end, the person was pointed out and the audience turned and applauded the person if they weren’t at or near the stage. That didn’t happen here. Schrodingers cat comes to mind. Has anyone seen Norman Bates around? Just imagine if RBG was a Constitutionalist, the MSM would be losing its collective mind over her absence. Shoot. If they thought she was still alive, they would probably be planning her demise. Yep, the MSM is so predictable. Sad. This “opera” was presented as a part of the continuing “Women in the Fine Arts” program that is sponsored by the gubmint and paid with tax dollars. This program was about, and perhaps honoring, RGB, but was in recognition of the “artist,” RGB’s DIL. There were obvious camera flashes from cameras taking pictures in the first part of the vid. There were no excited groups of people that would have been gathered and looking in the same direction, had RGB been there. The beginning of the program explained the meaning and purpose of the “Women in the Fine Arts” program. The speaker did not honor nor mention the presence of RGB. The “opera” was awful. As Nannie always said, least said better done, so that is all that is to be said about the opera. Although that “soprano,” the DIL, is screaming, not singing. At the end, the “composer,” the DIL, acknowledged and thanked all who had aided and participated in the “opera.”. RGB was neither acknowleged nor thanked. Conclusion – RGB was not there. Either that, or RGB has the most cruel, most thoughtless DIL since Sampson’s Delilah. So the question remains unanswered – Where’s Waldo?